Sid and Nancy (1986) [Sid Vicious]: Dies (off-screen) of a drug overdose; the movie ends while he is still alive, but I believe there was some on-screen text informing us of his death. Prick Up Your Ears (1987) [Joe Orton]: Beaten to death with a hammer by Alfred Molina while lying in bed. Rosencrantz and Guildenstern Are Dead (1990) [Rosencrantz]: Executed by hanging, along with Tim Roth; we only see a shot of the ropes drawing taut after they drop. State of Grace (1990) [Jackie Flannery]: Shot several times in the stomach by his brother (Ed Harris) on the pier at night. 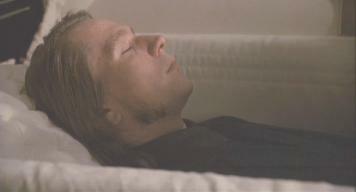 His body is shown again during his funeral. JFK (1991) [Lee Harvey Oswald]: Shot in the chest by Brian Doyle-Murray while being escorted out of the building by policemen. Bram Stoker's Dracula (1992) [Dracula]: Decapitated with a sword by Winona Ryder, after being stabbed in the chest and dragged into a church. True Romance (1993) [Drexl Spivey]: Shot in the crotch, then in the head, by Christian Slater in Gary's hangout. Immortal Beloved (1994) [Ludwig von Beethoven]: Dies of cirrhosis; it's been a while since I've seen this movie, but I believe his death was shown at the beginning, with previous events in his life being shown in flashbacks throughout the movie. Leon (The Professional; The Cleaner) (1994) [Agent Norman Stansfield]: Killed in an explosion when Jean Reno sets off the grenades strapped to his own chest, after Gary shoots Jean in the back. The Fifth Element (1997) [Jean-Baptiste Emanuel Zorg]: Killed in an explosion when one of his alien henchmen activates the bomb and destroys the space station. Hannibal (2001) [Mason Verger]: Mauled and eaten by wild pigs after Zeljko Ivanek drops him into the pigs' pit.